This was how this Match Review began to form as I left the Cottage at half past four (I think that in my Fulahish lifetime, I’ve only left before the final whistle three or four times, incidentally), after McDonald ridiculously demonstrated once again just how hapless we’ve become, looking a shadow of the inspirational hero of last season to earn a cheap second yellow card. I reasoned, once I arrived home, that maybe my initial reaction would be too harsh to share publicly and it would benefit from a delay in putting pen to paper so to speak. I’d already decided I was in no mood to watch the lowlights on the telly as I had just about seen my share for one day, so I’d leave the review until Sunday. Well, I’ve since watched MOTD and frankly, there’s nothing to add to the above. As our American owner was attending the match, one really has to speculate how he must feel about this astonishing reversal in so few games. I can't help hypothesising that if he's really serious about this crazy little hobby of his, he needs to have a heavier hand on the tiller because something is definitely not working in the navigation of our old tub. Bournemouth are another bogey team for the Whites. 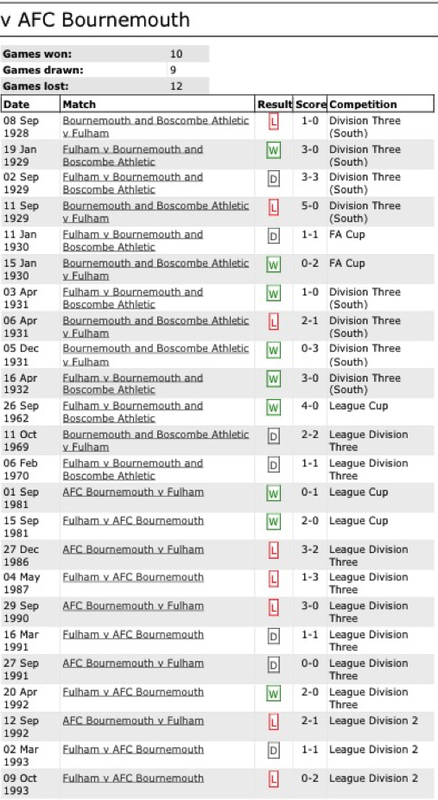 This is becoming something of a mantra, this season but sadly the record is ten won, nine drawn and twelve lost, we could certainly do with an eleventh victory over the Cherries to boost those stats and we need three points rather urgently too. To be fair, since our first meeting in 1928, we have met just 31 times, twenty six in the various levels of the English Leagues. Maybe if this was the next round of the Carabao we'd be hopeful of a win, as in the three games in that competion Fulham have a 100% record, the two FA Cup ties have us honours even. The only positive thing to say about dismal records like these is that they are there to be broken so let's hope that this season sees us end bad runs against our bogey teams, including Bournemouth and chalk up some welcome wins. Abject, spineless, clueless, embarrassing, pitiful, disgusting, rubbish, pathetic, ghastly, infantile, horrid, gormless, insulting, worthless, idiotic, immature, hopeless, pointless and incomprehensible!